Mont Saint-Michel, which annually hosts nearly 2.5 million visitors pilgrims and tourists, has undoubtedly the most famous tourist locations of France. Its silhouette lost in the middle of the bay attracts visitors from far and wide to discover this genuine medieval fortress built on a granite rock surrounded by swamps and quicksand. It is considered one of the finest " Wonders of the West". The site logically classified by Unesco, is second in number of visits to France. With its compact dimensions and located between Normandy and Brittany 3h30 from Paris, Mont-Saint- Michel is generally the subject of a day trip : the time to visit the town and its monuments, admire Bay and observe the changes in tide. Then you leave, no doubt, take a stroll on the ramparts which offer you beautiful views of the bay and the main street, where you will find many souvenir shops, hotels and restaurants. You can also take a lunch break and an omelet at the Mère Poulard, local specialty, included in the fees of your excursion. La Grande Rue du Mont-Saint- Michel is a long upward path through the village and up to the abbey. Very busy in the summer, it is the only street of Mont- Saint- Michel, so it seems impossible not to borrow despite the small passages which from time to time open on his side. Very close, the Main Street is lined with many stone mansions of the fifteenth and sixteenth centuries, some of which now house shops for tourists, pancake or museums. Among the many shops running through it, you will find MONS ( specialist artisan tradition of lace, embroidery, dolls, key chains, porcelain, Celtic jewelry, medals, bracelets, earrings ), THE GRAND BAZAAR (tapestries, weapons medieval, souvenirs, rings, confectionery, religious items, pottery, jewelry, swarovski, pieces of money in Paris... ), LE ROUET BRETON ( granites, eggs, gargoyles, china, cider, calvados, pommel, dragons, candle holders, Abbey biscuits... ) and many more! You will find particular Mère Poulard shop where you can take a little break and take the time to choose the perfect souvenir gift for your holiday in Mont Saint Michel. Postcards, branded clothing Mount, traditional brass (stoves, utensils... ), Luggage siglée Mont Saint Michel, collection " tableware " cookbook La Mère Poulard or enclosures The Collector Mère Poulard ( cakes, biscuits, cookies and shuffleboard. An exclusive selection of gourmet products and a wide selection of regional specialties )... A true concentrate of Mont Saint Michel in the heart of the medieval village ! The abbey of Mont Saint-Michel is of course the inevitable element of visiting this rocky outcrop : masterpiece of medieval architecture work, is located atop Mount and offer you a splendid full view of the entire bay and the medieval architecture of the eleventh to the sixteenth century Mont. Historic monument in 1874, it remains a center of Christian pilgrimage. The abbey was built in the eighth century on a granite rock and attracts three million visitors each year. Besides its religious appeal, the abbey of Mont-Saint- Michel attracts visitors by the beauty of its construction and its garden and its location nestled on a granite rock. Whether for faith or just for pleasure, it really deserves to be interested. Originally, it was the church of the inhabitants of the Mount, the Montois. The church has kept some remains of the eleventh century in the pillars, but in general, it is up to the fifteenth and sixteenth centuries. With a small steeple, it is rich with beautiful religious objects : a fifteenth-century stained glass, a medieval lying beheaded, an altar and columns altarpiece dated 1660, primitive baptismal font of the thirteenth century ; a Virgin and Child and Education of the Virgin ( Sainte Anne teaching Marie ) of the fifteenth and sixteenth centuries, and finally, a copy of the statue of St. Michael. The other big attraction is simply the bay and its shores with beautiful Norman landscapes : Mont-Saint-Michel is located in the heart of an exceptional environment. 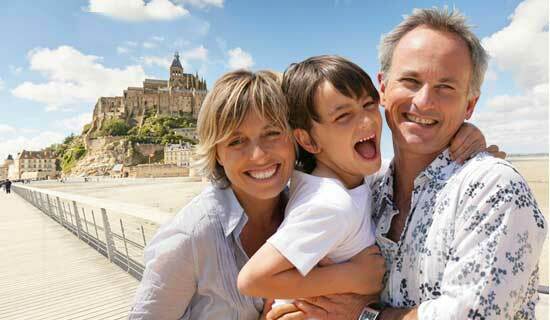 Indeed, the Mont-Saint- Michel has the highest tides in Europe that transform twice daily landscapes. 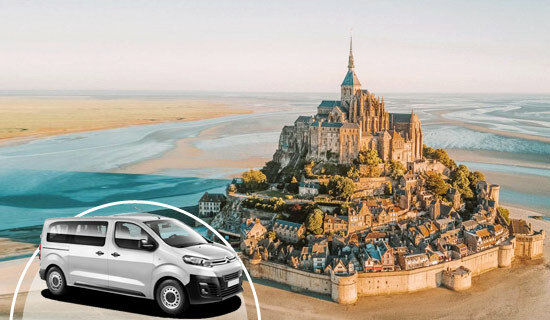 The days of high tides, one can have the chance to see the Mont-Saint- Michel become an island, entirely surrounded by water, a show that delights many enthusiasts. This fascinating show can still be dangerous : It is strongly advised not to venture alone into the Bay. Indeed, with a range of 10 meters, the tides are particularly important in this area. Moreover, the Mont-Saint- Michel is full of quicksand. It is for these two reasons that the nickname Mount has for a long time been " Saint-Michel-au- Peril-de-la-Mer ". THE RESTAURANT "LA MERE POULARD"
Since 1888, the Mère Poulard receives you in the purest tradition of French hotel and offers a picturesque setting of the facility remains unchanged. The restaurant embodies over 120 years a reference of French cuisine which combines subtly tradition, quality and simplicity. La Mère Poulard offers a rare dining experience if you want to taste traditional dishes and delicious recipes developed in the former that were successful Mère Poulard. The chef offers traditional recipes of La Mère Poulard, a kitchen between land and sea where fresh and local products are featured : lamb, salmon Norman, fish and shellfish delicacies... Not to mention among these revenues, the La Mère Poulard omelette, cooked over a wood fire as before, you can taste, tradition.